Dr. Suresh Challa has obtained his Master’s Degree in Biochemistry from Sri Venkateswara University, Tirupati in the year 1993 and received Gold Medal for being the first rank holder in the university. He has obtained his Ph.D in Biochemical Toxicology from the same university. His research interests includes Biochemistry, Cell Biology, Cancer Biology, Nutritional Biochemistry and Environmental Toxicology. His present research involves in addressing the pathologies associated with Osteoporosis and different therapeutic approaches in combating the disease and studying the intracellular effects of Cowpea isoflavones using both in vitro and in vivo models. Another area of research interest is being studying the synergic toxic effects of environmental Heavy metal Lead and amyloid peptides on brain using Human brain cell. Also making efforts in examining the toxic effects of these two in conditions such as Alzheimer’s and its protection by different neuroprotective compounds. He has experience in working with different areas such as Synthesis of Betulinic acid like derivatives and their anti-cancer effects, Photodynamic therapy and cancer prevention, phytoestrogens and their role in the adipocyte cell metabolism and also in the areas of colon cancer and obesity. He has been recognized as PhD research supervisor at Osmania university, Nagarjuna University, NTR Health University and JNTU, Hyderabad in the subjects of Biochemistry, Biotechnology and Nutrition. Dr. Suresh has received NIH Visiting Scientist Fellowship from 2004-2005 (one year) and also during 2010-2012 (two years) and did his research at USA. He also obtained prestigious ICMR Young Bio-medical Scientist fellowship for the years 2014-2015. He is a Fellow of Association of Biotechnology and Pharmacy (FABP) and an active member of several scientific bodies. 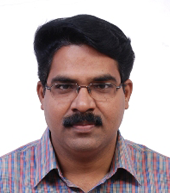 He is serving as faculty at NIN for different courses and also as Board of studies member at various universities. Suresh C and Dixit PK. Mitigative Effects of Koenidine in reducing the toxicity induced by heavy metal Lead in Human neuroblastoma cells. Journal of Chemical Biology and Therapeutics. 2016; 1:2. Rishika J, Vijayalakshmi V, Rajanna A, Naresh V, Suresh C. Possible synergistic role of Cowpea Isoflavones and Vitamin D combo in the bone formation of MG-63 osteoblasts. Journal of Vitamins and Minerals.2016; 5:3. Jyothi KSN , Shailaja M, Viveni J, Suresh C (2014) Identification of a Proteinaceous Alpha Amylase Inhibitor from a Medicinal Herb Oxalis corniculata L. (Oxalidaceae). Journal of Homeopathy Ayurvedic Medicine.2014; 3:165. Rao S, Suresh C. In vitro and in vivo effects of the leaf extracts of Cassia tora and Cassia sophera in reducing the cytotoxicity and angiogenesis. British Biotechnology Journal. 2013 Jul 1; 3(3):377. Suresh C, Vijayalakshmi V. Protective Effect Of Phytoestrogens Like Daidzein And Genistein Against Oxidative Stress In The Caco-2 Colon Carcinoma Cells. Annals of Nutrition and Metabolism. 2013 Sep 1; 63:1720. Rao S, Vijayadeepthi MZ, Zoheb M, Suresh C. Evaluation of antioxidant and antimicrobial potential of two edible Cassia species to explore their neutraceutical values. Journal of Pharmacy Research Vol. 2012 Mar; 5(3):1650-5. Suresh C, Johnson J, Mohan R, Chetty C. Synergistic effects of amyloid peptides and lead on human neuroblastoma cells. Cellular and Molecular Biology Letters. 2012 Sep 1; 17(3):408-21. Suresh C, Zhao H, Gumbs A, Chetty CS, Bose HS. New ionic derivatives of betulinic acid as highly potent anti-cancer agents. Bioorganic & medicinal chemistry letters. 2012 Feb 15; 22(4):1734-8. Pasumarthi S, Chimata MK, Chetty CS, Challa S. Screening of phytochemical compounds in selected medicinal plants of Deccan Plateau and their viability effects on Caco-2 cells. Journal of Medicinal Plants research. 2011 Dec 30; 5(32):6955-62. Chimata MK, Chetty CS, Suresh C. Fermentative Production and Thermostability Characterization of 𝜶 Amylase from Aspergillus Species and Its Application Potential Evaluation in Desizing of Cotton Cloth. Biotechnology research international. 2011 Oct 3; 2011. Zhao H, Holmes SS, Baker GA, Challa S, Bose HS, Song Z. Ionic derivatives of betulinic acid as novel HIV-1 protease inhibitors. Journal of enzyme inhibition and medicinal chemistry. 2012 Oct 1; 27(5):715-21. Jyothi KS, Hemalatha P, Challa S. Evaluation of α-amylase inhibitory potential of three medicinally important traditional wild food plants of India. International Journal of Green Pharmacy (IJGP). 2011; 5(2). Suresh C, Johnson J, Modeste TM, Chetty CS. Protective role of epigallocatechin 3-gallate against lead-induced toxicity in human neuroblastoma cells. Toxicological & Environmental Chemistry. 2011 May 1; 93(5):1018-27. Jonnalagadda PR, Prasad AY, Reddy KA, Suresh C, Rao MV, Ramya G, Rao DR. Biochemical alterations of certain health parameters in cotton growing farmers exposed to organophosphorous and pyrethroid insecticides. African Journal of Biotechnology. 2010; 9(49):8369-77. Chimata NK, Sasidhar P, Challa S. Production of extracellular amylase from agricultural residues by a newly isolated Aspergillus species in solid state fermentation. African Journal of Biotechnology. 2010; 9(32):5162-9. Chimata MK, Pasumarthi S, Challa S. Optimization and Production of extracellular amylase from newly isolated Aspergillus species by Submerged Fermentation. Current Trends in Biotechnology and Pharmacy. 2010 Jul 1; 4(3):795-800. Chennaiah S, Vijayalakshmi V, Suresh C. Effect of the supplementation of dietary rich phytoestrogens in altering the vitamin D levels in diet induced osteoporotic rat model. The Journal of steroid biochemistry and molecular biology. 2010 Jul 31; 121(1):268-72. Nagajyoti PC, Dinakar N, Suresh S, Udaykiran Y, Suresh C, Prasad TN, Damodharam T. Biomass Industrial Effluent Effect on Carbohydrates, Aminoacids, Nitrite and Nitrite Enzyme Activities of Arachis hypogaea L. Agricultural Sciences in China. 2009 Feb 1; 8(2):203-15. Dinakar N, Nagajyothi PC, Suresh S, Damodharam T, Suresh C. Cadmium induced changes on proline, antioxidant enzymes, nitrate and nitrite reductases in Arachis hypogaea L.
Nagajyothi PC, Dinakar N, Suresh S, Udaykiran Y, Suresh C, Damodharam T. Effect of industrial effluent on the morphological parameters and chlorophyll content of green gram (Phaseolus aureus Roxb). Journal of Environmental Biology.2008; 30 (3): 385-388. Suresh C, Vemuri MC, Chetty CS. Effect of epigallocatechin 3-gallate in human neuroblastoma cells exposed to lead. Comparative Biochemistry and Physiology Part C: Toxicology & Pharmacology. 2008 Nov 30;148(4):462-3. Suresh C, Padmaja J, Kumar PU, Divya K, Sandesh P, Kumar MS. Alterations in the antioxidant profile in patients with colorectal carcinoma. Current Trends in Biotechnology and Pharmacy. 2008;2(4):531-7. Nagajyoti PC, Dinakar N, Prasad TN, Suresh C, Damodharam T. Heavy metal toxicity: Industrial effluent effect on groundnut (Arachis hypogaea L.) seedlings. Journal of Applied Sciences Research. 2008;4(1):110-21. Chetty CS, Vemuri MC, Reddy GR, Suresh C. Protective effect of 17-β-estradiol in human neurocellular models of lead exposure. Neurotoxicology. 2007 Mar 31;28(2):396-401. Prakash MS, Chennaiah S, Murthy YS, Anjaiah E, Rao SA, Suresh C. Altered adenosine deaminase activity in type 2 diabetes mellitus. Age. 2006;43(6.2):44-6. Suresh C, Dennis AO, Heinz J, Vemuri MC, Chetty CS. Melatonin protection against lead-induced changes in human neuroblastoma cell cultures. International journal of toxicology. 2006 Nov 1;25(6):459-64. Chetty CS, Vemuri MC, Campbell K, Suresh C. Lead-induced cell death of human neuroblastoma cells involves GSH deprivation. Cellular and Molecular Biology Letters. 2005 Jan 1;10(3):413. Suresh C, Tiwary RS. Role of Nutrients in cancer (Review).Journal of Applied Nutrition.2000; 25:1-19. Nagajyothi PC, Dinakar N, Udaykiran Y, Prasad K, Suresh C, Damodharam T. Effect of biomass power plant effluent on biochemical parameters of Arachis hypogaea L. Asian Journal of Chemistry.2008;20(7):5489-5496. Suresh C, Johnson J, Wyatt MC and Chetty CS. Influence of Environmental Phytoestrogens in Nutrition and Health published in a book "Environmental Pollution, Ecology and Human Health ", NAROSA publication, Eds: Gottipolu RR et al.2011; 97-108. Suresh C. 2010. Phytoestrogens and their role as bio-resources in promoting health and curbing diseases. Book Chapter: Bioresources for Food Security and Rural Livelihood Pages 111-125, Narendra Publishing House, Eds GK Kulkarni and BN Pandey. Chetty CS, Vemuri MC, Campbell K, Suresh C. Neurotoxic effects of Lead on human neuroblastoma in cell cultures. Abstract been published in The Toxicologist an official journal of Toxicological Sciences.2006; 90 (1): 366. C. Suresh. 2010. Phytoestrogens and their role as bio-resources in promoting health and curbing diseases. Book Chapter: Bioresources for Food Security and Rural Livelihood Pages 111-125, Narendra Publishing House, Eds GK Kulkarni and BN Pandey. NIN-Visiting Research Scientist Fellowship to USA during 2010-2012 for two years. ICMR Young Bio-medical scientist Fellowship for the years 2014-2015; visited USA for six months. Qualified GLP personnel for the NGCMA, Ministry of Science and Technology, Govt of India.